Policy makers in India are finally acknowledging a structural shift in the agriculture sector they have been noticing for a decade. Economic contribution of livestock is today more than that of food grain crops. Traditionally, of the three components of the sector—crops, livestock and fisheries—crops drove the growth, and food grains are a major part of it. As a result, policy and programmes focused on crops. When in 2002-03, monetary contribution of livestock surpassed that of food grains, policy makers ignored it as a temporary coping mechanism of the poor in the face of sluggish agriculture due to repeated droughts. But livestock contribution has since remained higher by 5-13 per cent, says Pratap Singh Birthal, principal scientist at the National Centre for Agricultural Economics and Policy Research. In fact, both livestock and fisheries components have been growing faster than the crops component for a decade. A report for the upcoming 12th Five Year Plan in December accepted this shift by recognising livestock as the engine of agriculture growth. Livestock now controls a quarter of the agriculture gross domestic product (GDP). In 2010-11, it generated outputs worth Rs 3,40,500 crore (at current prices). This was 28 per cent of the agriculture GDP and about 5 per cent of the country’s GDP. “The total output from livestock was higher than the value of food grains (Rs 3,15,600 crore) and fruits and vegetables (Rs 2,08,800 crore), and this is going to go up substantially,” estimates V K Taneja, vice-chancellor of Guru Angad Dev Veterinary and Animal Science University in Ludhiana. After livestock, paddy is the next highest contributor to the agriculture GDP, says A Rajasekaran, senior manager with the National Dairy Development Board at Anand in Gujarat. In 2009-10, output from livestock was 2.5 times the value of paddy and more than thrice the value of wheat, as per the Central Statistical Office data. “Animals are natural capital, which can be easily reproduced to act as a living bank with offspring as interest, and an insurance against income shocks of crop failure and natural calamities,” says Taneja. Livestock output is the fastest growing among the three components. Its contribution to the total output of the agriculture sector increased from 15 per cent in 1981-82 to 26 per cent in 2010-11. “This provided a cushion to agriculture growth,” says Birthal. The rate of growth of livestock output has, however, slowed down. In 1980s, its growth rate was 5.3 per cent—almost twice that of the crops. This declined to 3.6 per cent in 2000s but is still 1.5 times the rate of growth of the crops component. Driving livestock growth are changes in the utility of livestock for farmers and in food consumption pattern. Importance of livestock as the “draught power” has declined due to mechanisation of agricultural operations and declining farm sizes (see ‘Female bias). Use of dung is also being replaced by chemical fertilisers. At the same time, consumption of livestock products like eggs, milk and meat is increasing due to rise in the income of the booming middle class, both in urban and rural areas. Between 1983 and 2004, the share of animal products in the total food expenditure increased from 21.8 per cent to 25 per cent in urban areas and from 16.1 per cent to 21.4 per cent in rural areas. Between 1951 and 2007, India’s livestock population increased by 81 per cent. There was an increase of about 28 per cent in cattle, 143 per cent in buffaloes, 82 per cent in sheep and 198 per cent in goats. But the populations of horses and ponies registered a decline of 60 per cent, camels 17 per cent and donkeys 69 per cent. This shows a bias towards animals that provide food, not labour. Among cattle the decline was largely confined to the male population, an important source of draught power in Indian agriculture, says V K Taneja, vice-chancellor of Guru Angad Dev Veterinary and Animal Science University in Ludhiana. The population of adult female cattle has kept on increasing. The share of adult female in total cattle population rose from 30 per cent in 1982 to 37 per cent in 2003. “Small and marginal farmers, landless labourers and women are more dependent on livestock for supplementing incomes and generating gainful employment in rural areas,” says M M Roy, director, Central Arid Zone Research Institute and member of the working group set up by the Planning Commission to deal with the animal husbandry and dairy sector for the 12th five-year plan. Policy makers are taking a serious note of this new economy. It is now seen as a major support for the crops sector to project decent overall agriculture growth. For example, a note of the Economic Advisory Council to the Prime Minister on fiscal outlook for 2010-11, estimated an optimistic agriculture growth based on the growth in the livestock economy. Despite the drought of 2009, growth in the livestock sector will ensure that the agriculture sector growth will be stabilised, it stated. “The livestock sector is expected to emerge as an engine of agriculture growth in the 12th Plan and beyond in view of rapid growth in demand for animal food products,” says the report of the working group on animal husbandry and dairy. Livestock has assumed the most important role in providing employment and income generating opportunities, says Roy. 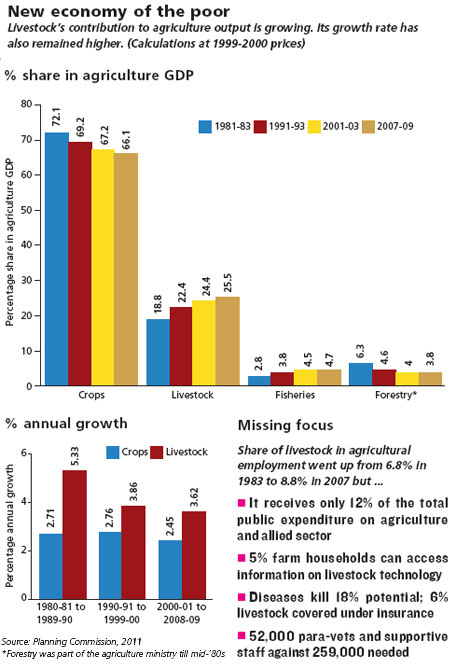 While crops still employ the maximum people, employment in livestock is fast catching up. 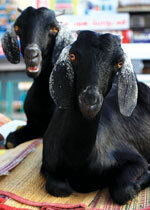 Rise of the livestock sector has implications for poverty. “Rural poverty is less in states where livestock contributes more to farm income,” concludes the Planning Commission report. Punjab, Haryana, Jammu and Kashmir, Himachal Pradesh, Kerala, Gujarat and Rajasthan are a case in point. Mostly, marginal farmers and those who have quit farming are joining the livestock business. About 70 per cent of the livestock market in India is owned by 67 per cent of the small and marginal farmers and by the landless, says Roy. One way, prosperity is now more dependent on per capita livestock ownership than on farms. “This implies that the growth of the livestock sector would have more effect on poverty reduction than the growth of the crops sector,” adds Birthal. But this is not the full potential of the sector. Absence of policy focus has stifled the sector that caters to the poorest. India’s livestock productivity is 20-60 per cent lower than the global average. Deficiency of feed and fodder is the biggest factor responsible for 50 per cent of the total unrealised production potential, followed by inadequate breeding and reproduction, and increasing diseases among animals. As livestock is less prone to global warming and climate change, it can be considered more reliable than rain-fed agriculture, says N G Hegde, an expert on livestock and rain-fed agriculture. But livestock receives only 12 per cent of the total public expenditure on the agriculture and allied sector and four-five per cent of the total institutional credit flow into the sector. 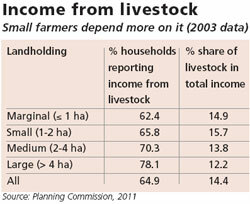 Hardly six per cent of the livestock are insured. The only Centrally sponsored scheme on livestock extension, with a budget of Rs 15 crore in 2011-12, is yet to spend a penny. “Adoption of livestock-related technologies is poor because of absence of animal husbandry extension network,” says Taneja. During the 11th Plan it was decided to establish the Indian Council of Veterinary and Animal Science Education and Research. It is yet to take off. The working group for the 12th Plan has repeated the suggestion. In india there has been always a good yeild for crops but the distribution is very poor.The lands owned by the farmers are occupied by industrialists and it is made barren.The fertility of soil,the distribution of food grains equally to all individuals and the mordern agricultural techniques are reqiured to make our farmers realise their importance and value on earth.Is it necessary that there must be some reduction in crop production only then livestocks will rise.The graph has shown decline in the forestry.As far as ecology is concerned all species are important so are the flora and fauna.There is till lots to be done for sustainable management of ecosystem.The most important step is the to check the policies and their implementations. Wish the news item was correct. The author should have cross checked the numbers and the interpretations. Sourcing from Planning Commission does not ensure robustness except tantalising the news significance. Hopefully it will not be repeated. This rude shock emanates from the Approach to 12th Five Year Plan document that has prescribed a robust approach to sustaining the inclusive and faster crisis in the agriculture and allied activities. Certainly the working group failed to think out of the box solutions to the crisis. Thanks and very nice analysis. I think, in rural India the symbiotic relation and inter dependence between agriculture, forestry and livestock can't be ruled out. But the growth trend which you have indicated is more towards livestock which doesn't fall into the priority area of government policy and programme, and despite this sector is doing well. I feel more focus, extension and promotion is required to boost this sector primarily for the rural landless people. Thanks Prof. George, the numbers are from national accounts/settled balance sheets of Government of India. So, they are credible. As far as interpretation is concerned, it is factual as the content of the story vouch. But do agree we need to think 'out of the box'. And more so in an emerging sector like the livestock. Very interesting piece, but the growth of the livestock sector in India -- both in terms of numbers of animals and the intensity with which they are produced -- pose significant challenges for food security, equity, resource use and control, public health, and animal welfare and rights, particularly as the effects of climate change become more intense. Public policy action tank Brighter Green (www.brightergreen.org) has just completed a policy paper taking an in-depth look at this set of issues in India. We'd welcome your reading, posting, and offering us feedback on it: http://www.brightergreen.org/files/india_bg_pp_2011.pdf We also have related videos on our YouTube channel: BrighterGreenNY. It is delightful to hear that Livestock contribution to economy is increasing. But it is a sad state of affair that crop production is decreasing. Hence livestock contribution cannot be taken as a real substitute for the overall agricultural contribution. Crop production is as important as livestock production since a highly populated country like India has to suffice its food needs. The planning commission should take note of this aspect too while formulating plans. Simply providing importance for items that has high economic contribution would only disrupt the need of the future.